US President Donald Trump was upbeat on Thursday (Jan 31) about high-level trade talks with Chinese officials in Washington but said no final deal would be made until he meets Chinese President Xi Jinping. "Meetings are going well with good intent and spirit on both sides", Trump said in a tweet Thursday. 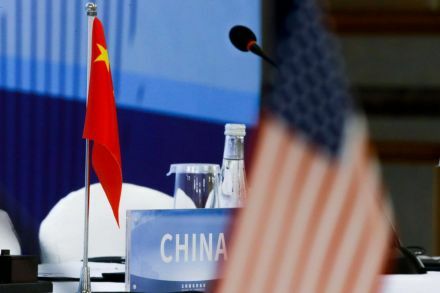 The world's two largest economies are trying to strike a deal on trade by early March to avoid a planned increase in the tariff rate being imposed on Chinese imports by the United States. While saying that Wednesday's first meetings between American and Chinese negotiators had gone well, Trump added in a morning tweet that "No final deal will be made until my friend President Xi, and I, meet in the near future to discuss and agree on some of the long-standing and more hard points". The US President also addressed the ongoing trade talks between Washington and Beijing. The Trump administration opened high-stakes trade talks with China on Wednesday. With just about one month to go before the U.S.
Trump, meanwhile, has seen his public approval ratings battered by the partial government shutdown and is said to worry about the tariff war's impact upon USA financial markets. US President Donald Trump has repeatedly said he favors a healthy Chinese economy, but not at the expense of American business and know-how. "Without this a deal would be unacceptable!" But Trump also may appear weakened after agreeing to end a five-week government shutdown without extracting any concessions from opposition Democratic lawmakers in a battle over funding to build a wall on the Mexican border. "The talks will continue and you can not expect to solve all the issues at once", said Liu Weidong, expert in USA affairs at the Chinese Academy of Social Sciences. US Trade Representative Robert Lighthizer, 71, is leading the American negotiating team, taking over from Commerce Secretary Wilbur Ross and Treasury Secretary Steven Mnuchin, who did not deliver on a breakthrough. Still, time is running out to reach a new trade agreement before the US-China tariff truce expires at the beginning of March and the trade war resumes in full force. Both sides agreed to start talks on reforms with respect to forced technology transfer, intellectual property protection, non-tariff barriers, cyber intrusions and cyber theft, and opening the Chinese market to US services and agriculture. Beijing, in response, retaliated with tariffs against US products. The Chinese Communist Party's (CCP) expedited its review of the foreign investment law, which was meant to serve as a bargaining chip for trade negotiations, according to Xie Tian, a professor at the University of SC. Chinese officials deny that they force US companies to transfer technology. "Those are separate issues", Treasury Secretary Steve Mnuchin told U.S. media ahead of the talks.